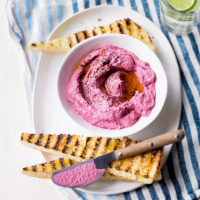 Serve this seasonal summer pâté spread on toast or warm pitta, as a dip with vegetable sticks or as a main course with dressed salad leaves. 1. Preheat the oven to 200°C, gas mark 6. Peel the beetroot and cut into 2cm chunks. Place in a roasting tin, toss in the olive oil and sprinkle with the cumin. Add a little salt and pepper, toss again then roast for 30 minutes, or until the beetroot is tender. Allow to cool for 10 minutes then tip into a food processor. 2. Grate the zest of the orange into the food processor, then squeeze the juice in. Blend until smooth, then add the soft cheese and horseradish and blend again. roughly chop the walnuts, if using, and add them to the mix. Season to taste and pile into a bowl. Serve with pitta bread fingers or toast, or as a main course with dressed salad leaves, grated carrot and thinly sliced fennel.